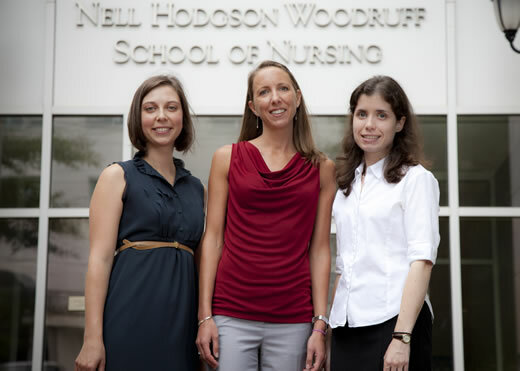 Nancy McCabe (left), Brittany Butts, and Christine Feeley are the first three scholars to benefit from a major grant from NIH to train nurse scientists in chronic disease. As a clinical nurse in a pediatrics unit, Christine Feeley PhD RN couldn't help but notice the time and energy that mothers devoted to caring for their chronically ill children. Her observation raised compelling questions in her nursing practice. How does having a chronically ill child affect maternal caregivers' ability to juggle multiple responsibilities? And how does their caregiver role affect their health, especially quality and duration of sleep? To answer those questions, Feeley earned a doctorate in nursing at the University of Alabama at Birmingham. In her dissertation, she looked at sleep quality, stress, caregiver burden, and quality of life in mothers whose children have bronchopulmonary dysplasia (BPD). "I found that maternal caregivers of young children with BPD were reporting about four to five hours of sleep a night and had elevated stress and caregiver burden levels," says Feeley. "After I graduated with my PhD, I wanted to continue in this area, which brought me to Emory. This past fall, Feeley was one of three nursing scholars benefitting from a $1.5 million training grant awarded by the National Institutes of Health (NIH). It is one of 17 such grants awarded by NIH to nursing schools across the nation. During the next five years, the School of Nursing will train a total of 17 predoctoral students and postdoctoral fellows to improve outcomes for patients with chronic illness. The need for such training is vital. According to the Centers for Disease Control and Prevention, chronic disease causes seven out of every 10 U.S. deaths. "We want to prepare nurse scientists to engage with individuals, families, health care providers, and communities to design and test interventions that lead to better outcomes," says Sandra Dunbar DSN RN FAAN FAHA, Charles Howard Candler Professor of Cardiovascular Nursing and grant codirector. Emory nursing scholars will study chronic conditions by surveying the various markers of disease and examining the cost-effectiveness of interventions. A key goal is strengthening patient self-management to encourage healthy behaviors and adherence to complex regimens to control disease. The NIH grant also serves as a nexus for bringing researchers together around a common interest. Scholars will interact with faculty from the School of Medicine, Rollins School of Public Health, Yerkes National Primate Research Center, and Emory College as well as the School of Nursing. "We selected chronic disease as our training focus because of the depth of our faculty research in this area of study," says Dunbar. "Intervention research represents an important area of growth for the school. We are building on what we have observed about different clinical problems by developing innovative ways to address them. "The first scholars are now paired with their faculty mentors. Brittany Butts, a BSN to PhD student in her first year of doctoral study, is working with Dunbar to reduce inappropriate use of emergency rooms by patients with chronic illness. Nancy McCabe, a BSN to PhD student in her third doctoral year, is looking at self-management of behaviors in adults diagnosed with congenital heart disease as children, guided by Dunbar and Carolyn Reilly 94MN PhD RN FAHA. Feeley is furthering her BPD study in collaboration with Ann Rogers PhD RN FAAN. In time, the new scholars will help elevate nursing science in ways that are meaningful to patients and their families. As Feeley notes, "By looking at sleep in maternal caregivers, especially measures of sleep that go beyond paper and pencil questionnaires, I hope to determine what is influencing their sleep the most so that we can develop and test ways they can maintain good health as they care for their children."